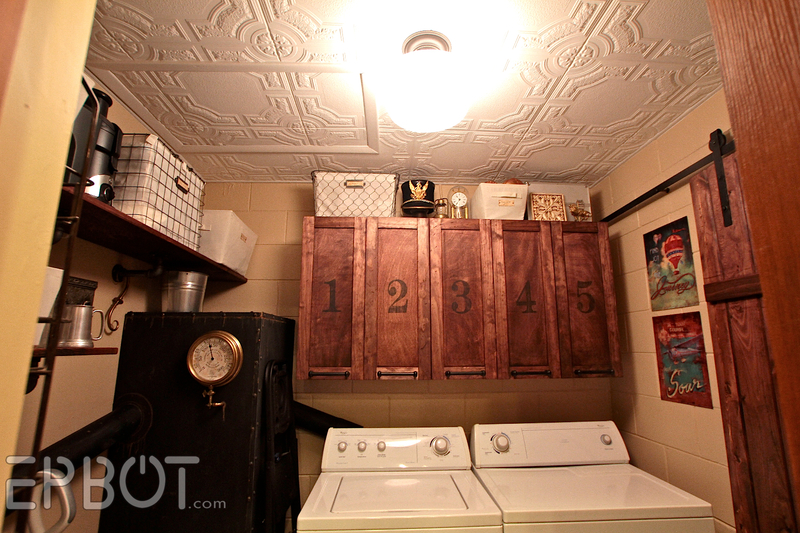 EPBOT: Steampunk Laundry Room Reveal! LOVE LOVE LOVE LOVE. I want to copy you in every way. 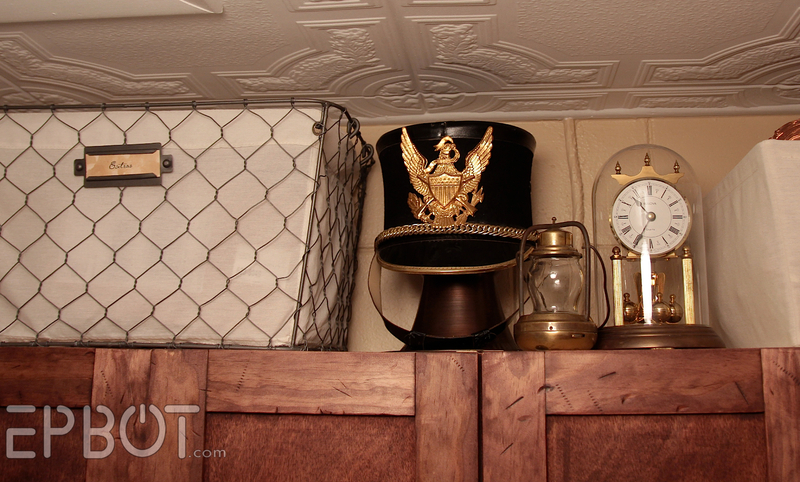 Also, as a total band nerd, I adore that you have a shako up there!! Wohooo!! Thank you! I was checking to see if anyone beat me to mentioning it. It looks so decorative and beautiful! And I *so* want to see a steam-punked Swiffer! 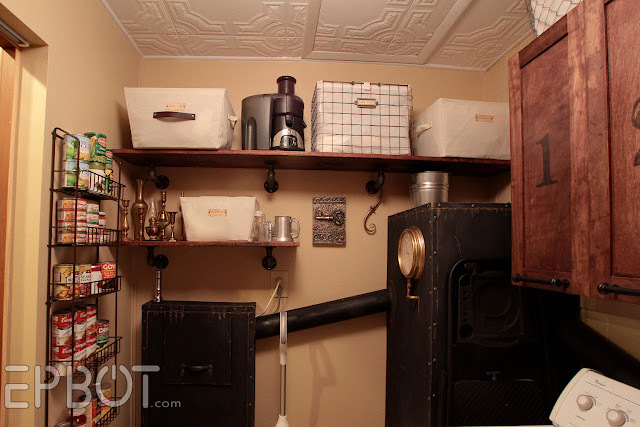 I am so surprised that the washer/drier aren't steampunked even the tiniest bit! 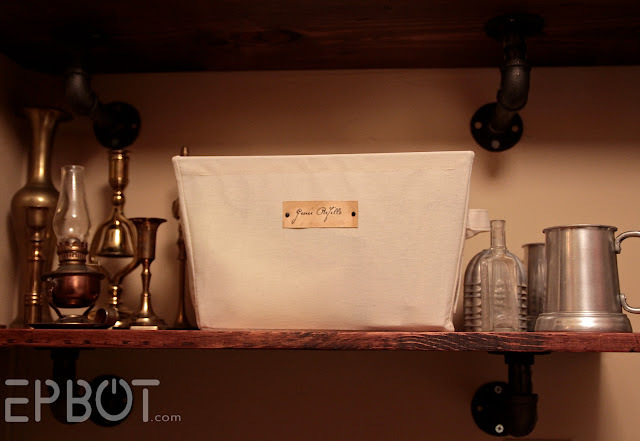 LOVE the shelf brackets! I never would have thought of that but it is so simple and creative. 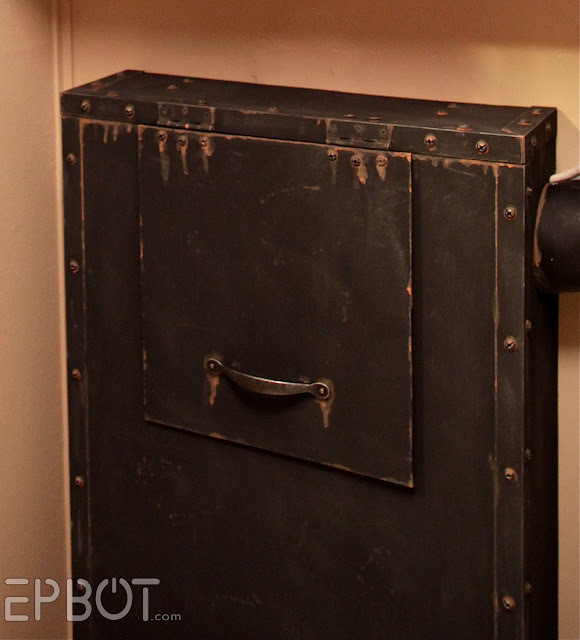 Plus, it can be used for non-steampunk rooms (ie a basement). Great job, as always! In case you ever get the urge to do something FABOO with your washer and dryer, head over to the Off Beat Home blog for instructions on how to paint your washer and dryer. 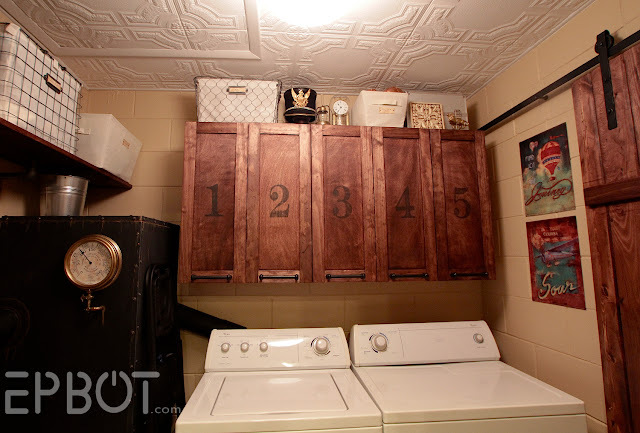 :D I'm in no way affiliated with them but when I saw your amazing laundry room redo and knowing your love of decorating, I immediately thought of this tutorial. How awesome is that ! I love how you keep your juicer in the laundry- that is where ours is too. Awesome! 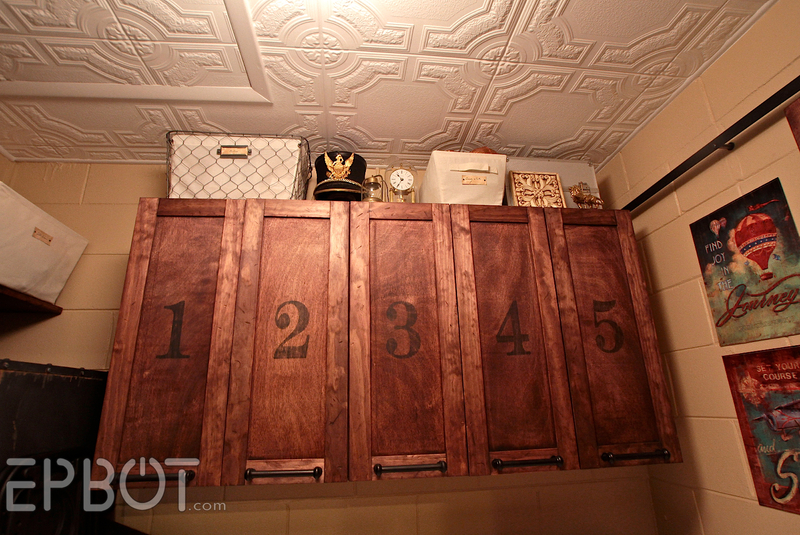 I love the "metal" boxes - fabulous idea! And my hubby is playing Bioshock right now. Totally awesome as always! 1) Sariah, you are a sweet nerd for knowing the term "shako". Yay! 2) Somebody remind me what the ceiling tiles are called and where I get them, please? I want the ones that cover popcorn ceilings. Spectacular! 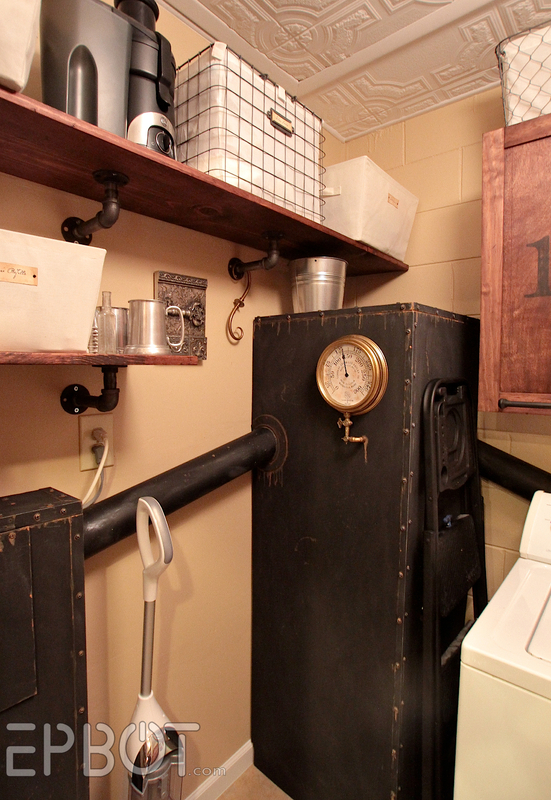 Are you going to steampunk the washer and dryer? Something similar to the water heater? You two are just amazing with a little paint and ingenuity. "Steampunk a Swiffer" had my snorting with giggles. It looks awesome as usual Jen. You'd be worth a fortune if taste in decor could be bottled and sold. Don't get rid of your washer & dryer unless they aren't working! The new ones they make don't last. My set is 20 years old and still going strong, my friends have gone through as many as 2 of each in the last 10 years. Superb! You did a great job - love the shelves and the water heater. What fun! It must be so delightful to go in for groceries or laundry now. When you get to steampunking your washer/dryer you could always paint the cat genie to look like a hot air balloon, right?! You know, you could use printable magnets on your laundry machines. Just sayin'. I'm very jealous right now. If anything I build/craft up turns out half as nice as the projects you create do, I will be a very happy camper. Bless me oh Gods of Craft, haha. It is seriously gorgeous. I <3 you and John so much. Giant couples crush. Keep being awesome - as if you have any choice in the matter! This is just. Totally. Freaking. Awesome. Wow, that is FANTASTIC! do washers & dryers come in black these days? (we have a black stove & fridge.) if you get new ones, black seems like it would be a good base for antiquing/steampunking. Holy cow, I'm stealing every idea here! I absolutely love the water heater & the pipe shelf supports & the cabinets & the sliding barn door- everything! And I just followed Marilyn's link above, and I'm totally painting our washer & dryer, maybe the fridge, the stove, the dishwasher... Can't wait to see your w/d if you do steam them up. 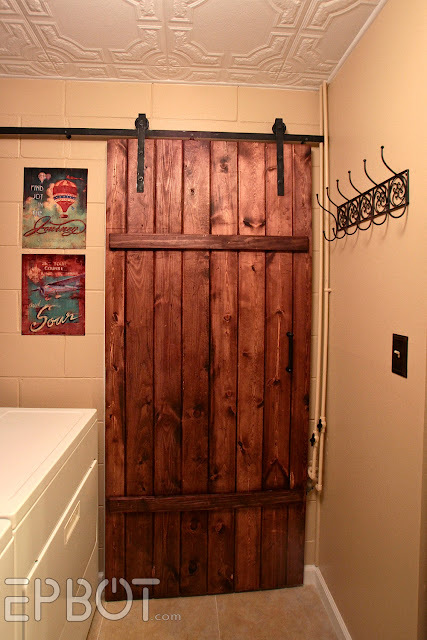 Wow, I love that water heater cover, it is such a clever idea! Do you like the cat genie? I was considering getting one but I hated the thought of it not working/eliminating odor. If I remember correctly (?) the cat genie needs water and electricity to run? We of four cats found a non-motorized alternative that to my thinking is almost as good as the genie. look up Omegapaw, it's like a standard litter box, but you never have to "scoop". Just roll it onto it's back, roll it back again, and pull out the drawer full of doodies. Freakin amazing IMHO. That and a little baking soda and you're good to go. We have 2 large boxes for 4 cats. When you replace the washer/dryer, you should get front loaders. That way, you could make the windows look like portholes! You should be able to use contact paper to cover your washer and dryer then apply any paint and pieces to the paper. Then when it's time to sell them, you can peel everything off (or the buyer could decide). Unless you had old pipe fittings laying around or found some at an old shop, I'd be willing to bet those are iron and not lead. Jagers and their hats.... and that sure is a fine hat you have! Totally works with the steampunk theme too! That or a steampunk windup drummer doll costume. Fantastic job! Love the handles on the cupboard doors. I may have to steal this for my kitchen. I completely agree with another anonymous commenter. Jagger Girl would match that hat perfectly. 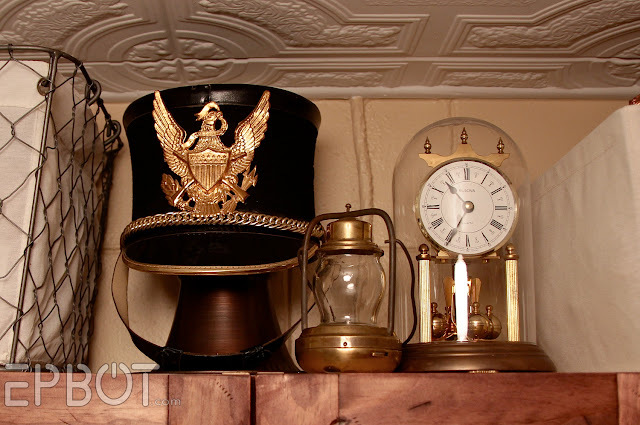 At first I was thinking Steampunk colonial soldier, but jagger leaves so many more options. Beautiful laundry room by the way. I'm sorry, but I'm jealous. I sure wish I had a laundry room (or a closet, for that matter) that I could decorate. Or even use, undecorated. That is amazing. We just moved into a newer house (2005 build) and are working on giving it some personality. Our first step was tiling the master bathroom shower. I'd never thought of doing much with the laundry room, but now I think it could be fun to slap a coat of paint on the wall and hang some art. I can't wait to see it once you've steampunked the washer and dryer. I must show my husband! 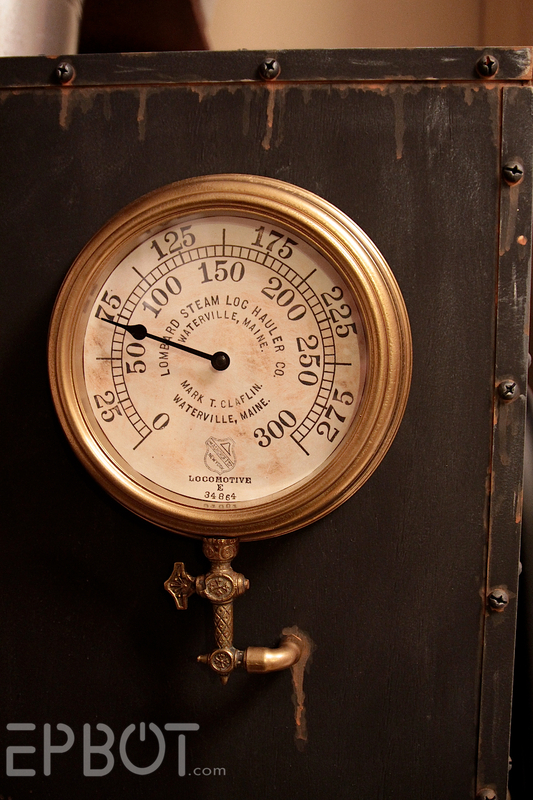 As someone currently at work in Waterville, Maine the gauge on your faux steam boiler makes me giddy! 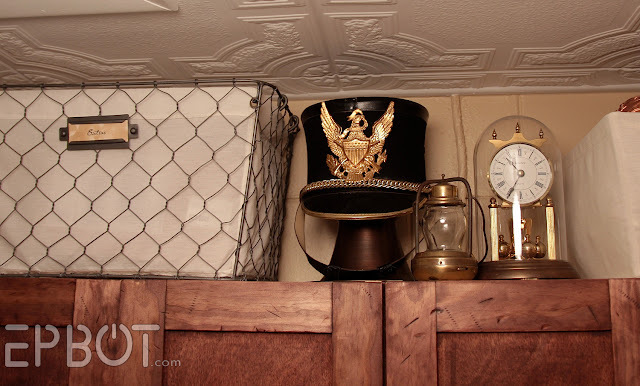 Please don't be annoyed at my posting a correction - this is strictly in case you want to know, but the band hat is called a Shako (college marching band ftw). Wow! *So* awesome! And I'll add to the pressure to steampunk the appliances! That was what I thought of, too! And you might as well do the cat genie while you're at it! LOL! So clever! Thoroughly enjoyed the watching the transformation. I want those metal Home Goods boxes. Yes, yes yes! 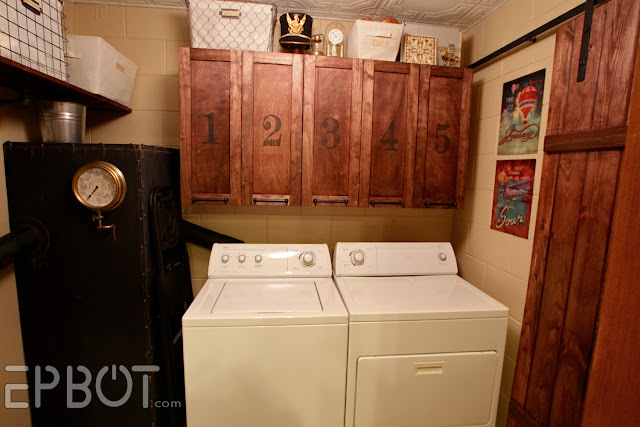 Steampunkify the washer and dryer too! And the cat box! :D And the vacuum! (which would be really neat... I'm an envisioning it as one of those diabolical weapons from Girl Genius). OMG the water heater! this is incredible. =) thanks for sharing! Wow. And I love RevAnne's idea about the vinyl wrap! So, that "band" hat looks more like a USMA West Point cadet parade hat - minus the shako - than a marching band. That's some good deal if you got it for less than $20! Yeah it looks awesome! Jen, I am always afraid that if I damage/change something it will loose value because someone else will not like it. Thank you for showing me that it really only matters if I like it and enjoy it. You are an inspiration! Love your courage! Wonderful! Well done! It almost makes me want to do laundry. Love love love the room! Man, if I had money, I'd pay you to come do mine! And on an odd note, you're the only person I know who has a cat genie. Would it be a worthy purchase? Above is a cure for your vacuum issue. I'm pretty sure you could do something awesome to the cat genie, but that might freak out the cats. I use an ostrich feather duster - great for getting those pesky cat hairs, and when spent gets a second life as cat toy in my home. The heads are replacable, so you could decorate the handle, and display the replacement on your band hat? I love all the detail in the room. Please post how John got that finish on the cabinets when you get a chance. Thanks. 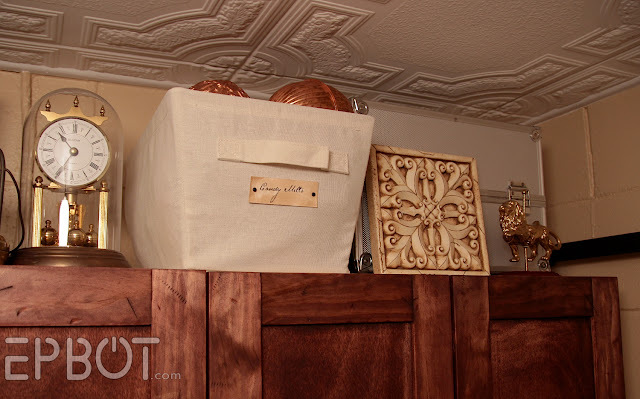 I have a whole tutorial on how we did the cabinets - including the finish - right here. Hope that helps! You can also steam-punk it up rather easily. In fact, you could make your own with some copper tubing and a bit of ply-wood, some pressure clamps and some appropriately coloured microfiber cloths. Swiffer is a good concept, but finding something you can use in the same way without throwing the cloth out each time is a more ecological idea. Just think how much you'd save on just no longer buying disposable cloths?!? If you spray a bit of furniture polish on your dry rag it will pick up every little bit of dust and dirt just like Swiffer, then switch to a wet rag and get the dirt and smudges with just a bit of water (add vinegar to the water for stubborn messes). If you prefer the smell of a nice lemon cleaner then add the peels from 2-3 lemons into a jar with 2 cups water and 1 cup white vinegar. Use that to clean and you won't have to worry about adding chemical products to the water table as well. Just these two small changes can save you over $20 per month if you use Swiffer quite regularly. It'll cost you a lot more to make your own "Swiffer" than to buy one, but for you that equates to hours of fun and steamy accessories for your pantry! I LOVE this room. 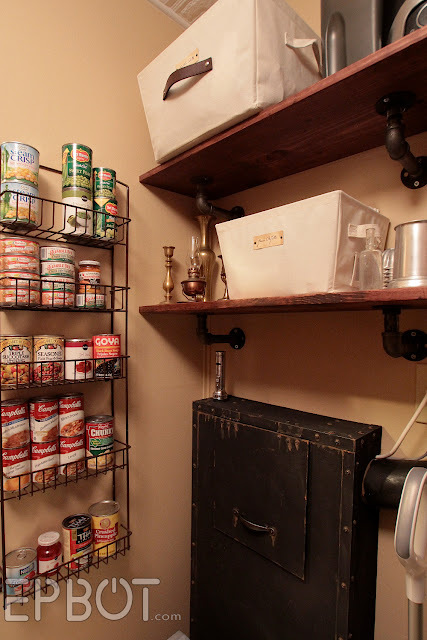 The pipe shelf-brackets are brilliant and I totally covet your water heater "case"! 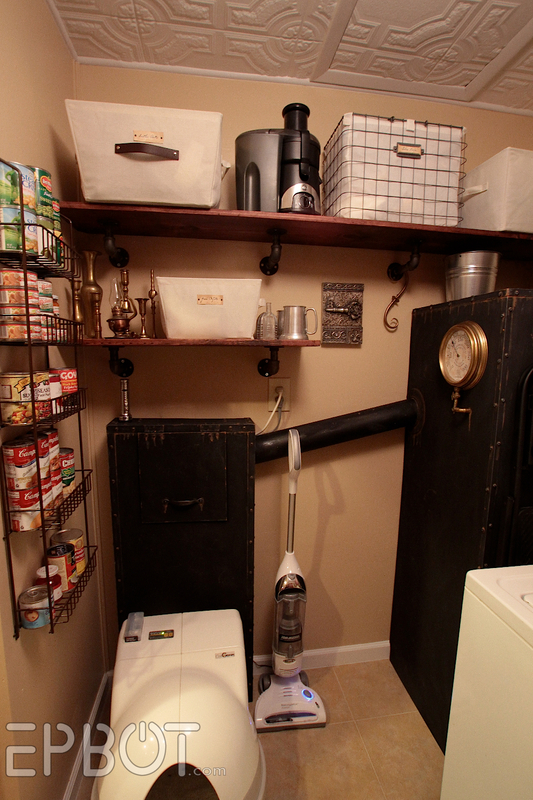 It's totally Steampunk but has so much usable, practical space. Nice job. Was just wondering if you decided to steam punk the washer and dryer? Oh Jen! This room is awesome! I bet you smile every time you walk into it. As a former bando-commando, I love the hat. I know I'm late to this commenting party, but I had to say that I've seen weird vacuum covers made to make your vacuum look like a creepy doll (I suppose they're not creep to everyone.Dolls just weird me out. But I loved your creepy doll mobile! It's just that regular dolls look just as creepy to me.*Shiver*). 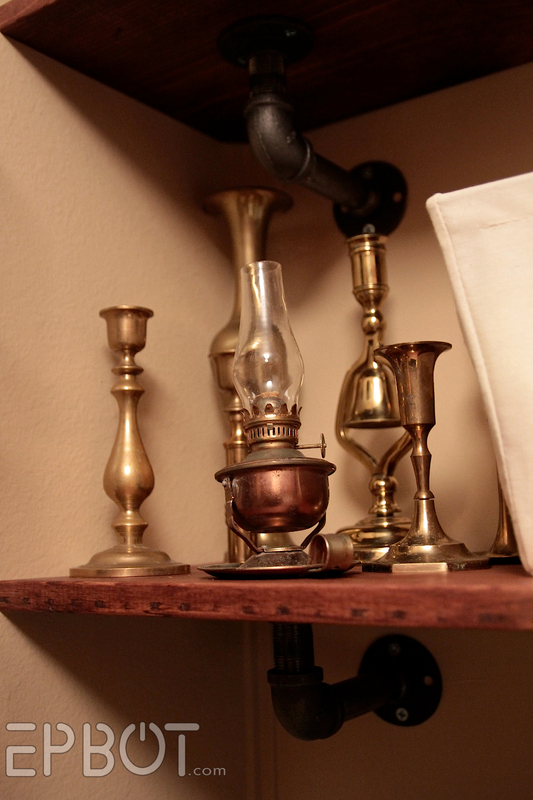 Anyway, I wonder if you could sew some sort of steam punk character for a vacuum cover? Just my weird random though.